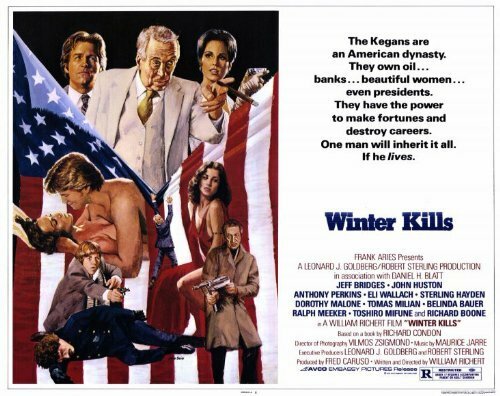 1979’s “Winter Kills”, chronicling the half-brother, Nick Kegan (Jeff Bridges), of the ex-President of the United States slain by a sniper 19 years earlier, did not make much of an impression at the box office, not least because its distributor pulled the film from theaters not long after its release. Possibly, as Turner Classic Movies notes, this was because Avco-Embassy’s parent company had defense contracts they feared this cinematic conspiracy theory might muck up. 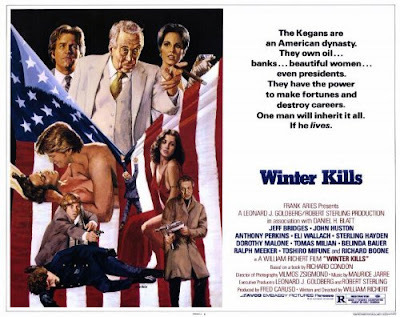 That might be true, who knows, and certainly the material contained within “Winter Kills” might make that feel more plausible than you would have initially thought, though the film’s tone, even for the 1970s, might well have put people off. The tone wavers between blackly comic and frightfully serious, where a few characters can be cracking ornery jokes one second and then shot dead the next. This tone, however, is not confused; this tone is deliberate. Written and directed by William Richert, who based it off satirist Richard Condon’s novel, “Winter Kills” shows the dark heart of politics to be as blackly comic as it is frightfully serious, where everything is something like a game with genuine stakes, and typically tied back to familial dynasties from which no son, no matter how much he might want, can extract himself, bound by political dynasty, seen acutely, comically, crazily in a scene where Nick leaps from bed and, still clad in his pajamas, rides a horse across a western landscape all to shout angry bromides at his dad, Pa Kegan (John Huston), a scene which plays like a funhouse mirror of some John Wayne western. Man, it made me laugh hard. The finer points of the conspiracy are mostly just cut and pasted from, as you might surmise, the innumerable conspiracy theories surrounding the assassination of John F. Kennedy in 1963. A dying man turns up to tell a bewildered Nick that he was the mysterious second gunman, sub-contracted by some evildoing, unknown agency to off the then POTUS, an agency that Nick will try to get to the bottom of. This involves Cuba, the mafia, and, oh yes, a shady nightclub owner, all of which you can find ready accessible in JFK too, and much of which is seen in delightfully askew flashbacks, which feel like put-ons of archetypal flashback scenes. The deeper the scheme goes, however, the less sense it seems to make, to us and to Nick, brought home in a late scene with John Cerruti (Anthony Perkins), some sort of crazed Transponster and ally of Pa Kegan, who essentially just stands there and tells Nick what happened. The irony, however, is that while Cerruti might be hidden away in some mysterious silo, like he’s on the set of Inspector Gadget, with a colossal video of earth looming, with “multiple expanding universes of information” at his disposal, the truth is so simple, pointing right back toward the Kegan name – that is, Pa. And if Pa ends up pointing the finger right back at Cerruti, well, isn’t that politics, a Rubik’s Cube? Jeff Bridges becomes the perfect surrogate for trying to solve the impossible, so convincing in his damn-the-torpedoes cluelessness. “Big Lebowski” fans, in fact, might recognize his predominant facial expression here as akin to the one he wields upon his infamous introduction to Maude Lebowski, a countenance of screamingly hysterical, genuine, unadorned bafflement, and it becomes something like the emblem of “Winter Kills.” Indeed, in perhaps the movie’s most comical moment, Nick finds himself driving onto the expansive property of the enigmatic, hard-bitten Dawson (Sterling Hayden), hoping for a meeting, only to suddenly find a damn Sherman tank coming right at him, forcing Nick to desperately maneuver in reverse before being met by a bevy of tanks coming from the other direction. He stops and climbs out of the car. Dawson emerges from the hatch, un-amused. And where most actors might understandably play up the fear, and while other actors might opt for sweaty panic, Bridges just stands there, mouth agape, confused. What’s happening? Hell if he knows.